YOU DON’T LOOK A DAY OVER 149! In honor of Chippewa Falls’ 150 anniversary, this summer’s Pure Water Days will have a “History of Chippewa Falls” theme. March will bring the kick-off of a year-long celebration of the Chippewa Falls sesquicentennial – or, more pronouncably, the city’s 150th anniversary. The logging-turned-tech town was granted a charter by the Legislature in 1869. Citizens are taking every opportunity to go big in 2019, with the city, the Heyde Center for the Arts, Main Street Chippewa Falls, the Northern Wisconsin State Fair, the Chamber of Commerce, and other local organizations and businesses collaborating to bring the party. The Heyde Center will host one of the first events of the celebration March 25, on the actual anniversary of Chippewa Falls’ founding. The venue will host the Wayward Players as they perform songs from local playwright Jerry Way’s Chippewa Falls 1869: The Musical. It’s a story about the signing of the proclamation that marked the city’s birth, with actors in period costume. The Chippewa County Historical Society will have books about the city on sale, and an exhibit of artifacts from the early 1800s on display. Complimentary snacks and beverages will be available during the event, which runs 5-8pm. The full play will hit the stage the following Thursday at the Heyde Center with 7:30pm shows March 28-30 – which will be preceded by a 6:30pm dinner catered by Karl’s BBQ Express – and a 2pm matinee March 31. The play will touch on the struggles and successes of the young Chippewa Falls, which suffered a flood, a fire, and even a logging war. “We’ve gone through some tough times, we’ve gone through some fantastic times,” Mayor Hoffman said. “To me, (the sesquicentennial) is the cherry on top of the chocolate sundae, because I have the opportunity to be here as we go through the 150th.” He is looking forward to seeing the milestone celebrated into the summer with the arrival of Pure Water Days, with Rockin’ the Chippewa Riverfront’s live music event, and more. Jackie Boos, tourism director for the Chippewa Falls Chamber of Commerce, is working on putting together an online landing page for all of the year’s celebratory events, which will be released mid-March. There, locals and visitors alike will be able to find out more about the events involved with the 150th anniversary. The Northern Wisconsin State Fair will get in on the action with sesquicentennial flavor July 10-14. Pure Water Days, now in its 43rd year, will be themed “History of Chippewa Falls,” in honor of the city’s birthday. 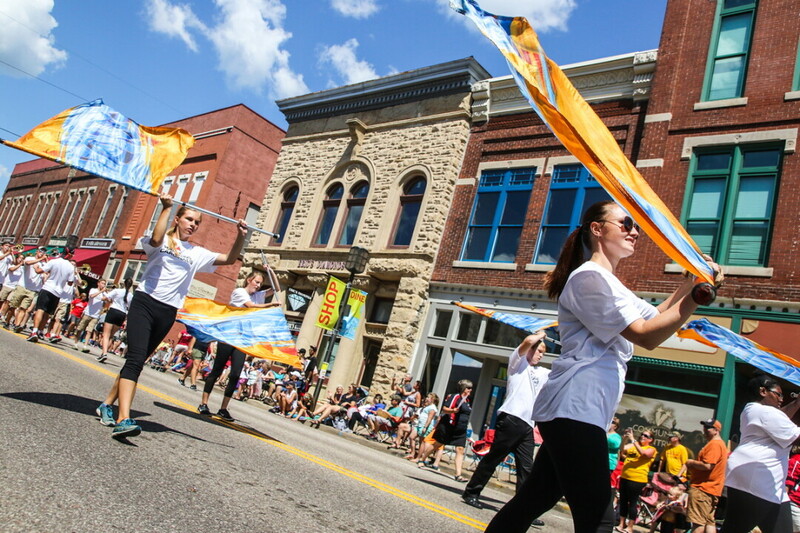 The Aug. 10 parade, which often features more than 70 floats, will begin at the corner of North Bridge and Cedar streets, and lead spectators down to Riverfront Park for RiverFest, where live music, vendors, and activities will be available. More events will be announced throughout the year. Keep an eye out for upcoming events to celebrate the Chippewa Falls sesquicentennial at gochippewafalls.com.